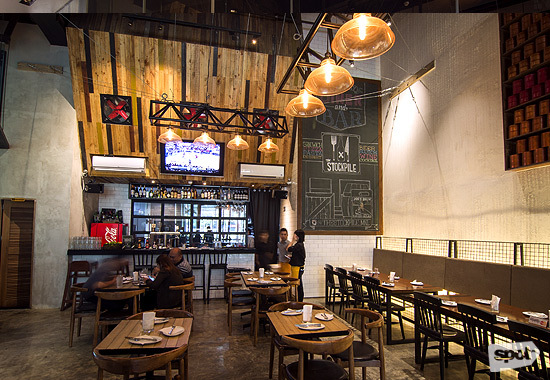 Your next stop for comfort food favorites, booze, and much more. (SPOT.ph) Sunshine Kitchen’s closure left us with heavy hearts and wanting stomachs, but Chef Tanya Chua says there’s no need to fret. 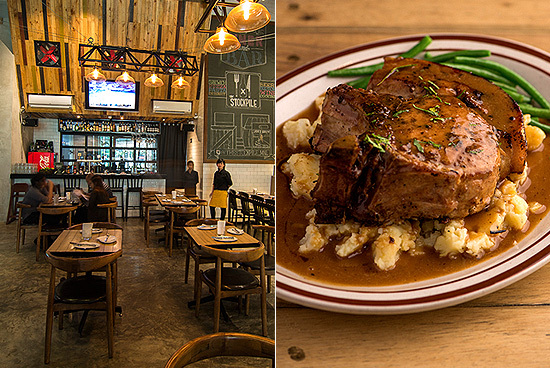 The now-defunct bistro’s best-selling dishes are available at her latest venture, The Stockpile, which she co-owns and manages with celebrities Geoff and Gabby Eigenmann. The look is completely different from Sunshine Kitchen. At The Stockpile, anything goes. The savory lineup is a mash-up of Chef Tanya’s favorites from different cuisines and the result is a winning combination of Sunshine Kitchen classics plus a few more dishes—all with special twists. 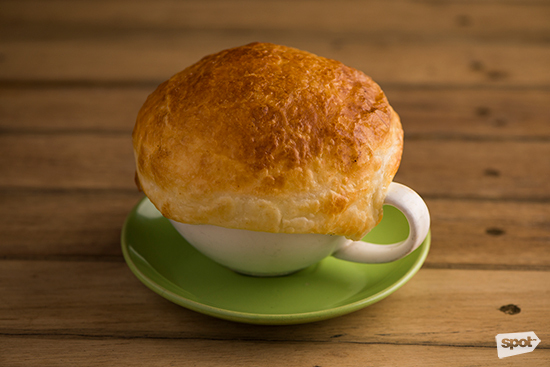 The Chicken Pot Pie Soup (P240) may be a familiar dish for those who are fans of Sunshine Kitchen. To best enjoy this creamy blend, break up the bread crust on top, and work your way in, mixing the dough together with the diced potatoes, carrots, and chicken bits. Slowly sip each spoonful to savor the balance of sweet and salty flavors. 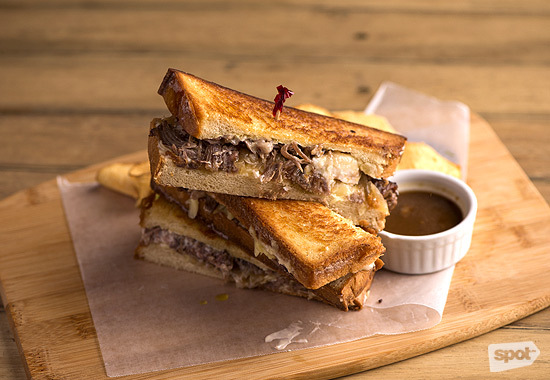 The Braised Beef and Grilled Cheese Dip with Truffle Sandwich (P450) is a spin-off of another Sunshine Kitchen favorite. Three buttered sandwiches make up this messy masterpiece, and each one is packed with tender beer-braised (they use Cerveza Negra!) meat slices and melted layers of tangy cheddar. 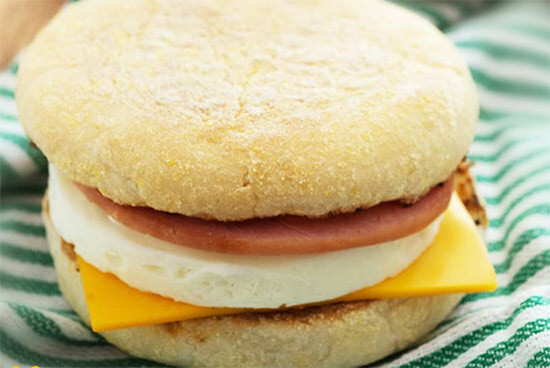 Coat it with Chef Tanya’s secret sauce before each bite to boost the sandwich’s savory profile. Then, follow it up with some fresh potato chips for a diversion in flavor, which you'll need every now and then. 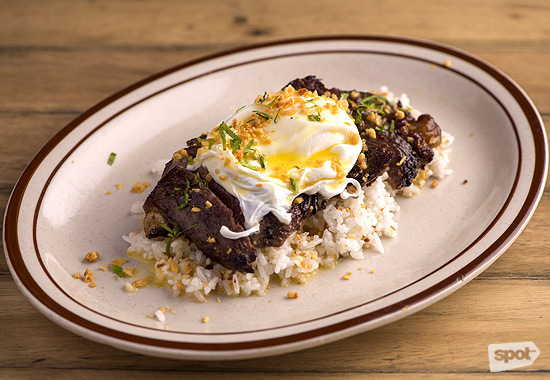 Chef Tanya’s Steak and Eggs (P440) is an impressive combination of tender, tapa-style USDA hanger steak and poached eggs served atop a bed of warm garlic rice. You've just found your new weekend brunch place. 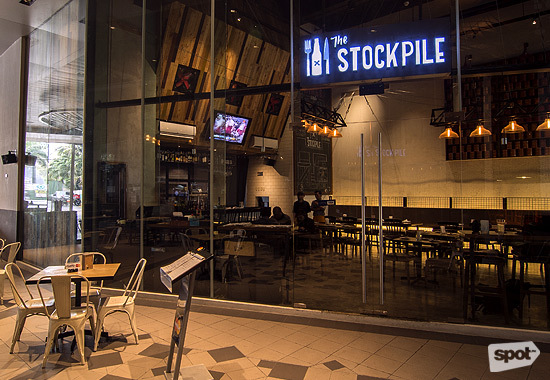 Have a go at their specialty meats, beginning with The Stockpile 6-hour Slow Roast Porchetta (P520) that Chef Tanya says you can’t get elsewhere. “We cook this differently,” she explains. “That’s why the meat is so juicy and it falls off the bone. It’s a favorite.” The Pan Roasted 24-Hour Brined Double Cut Porkchop (P480/with rice, P520/with mashed potato) is also worth a try, if only for its value. 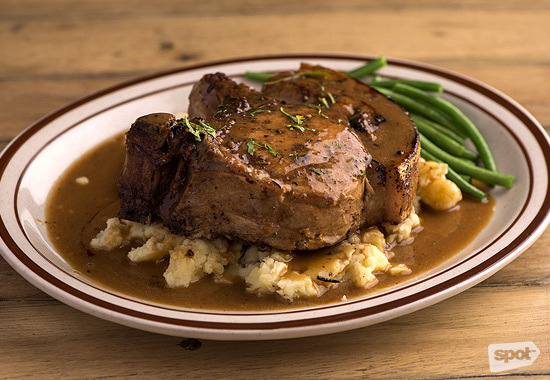 For a slab of meat so thick, it’s surprisingly tender and tasty from start to finish. Their suite of artisanal sourdough pizzas, meanwhile, are cooked in brick ovens to ensure a toasty, smoky aftertaste. 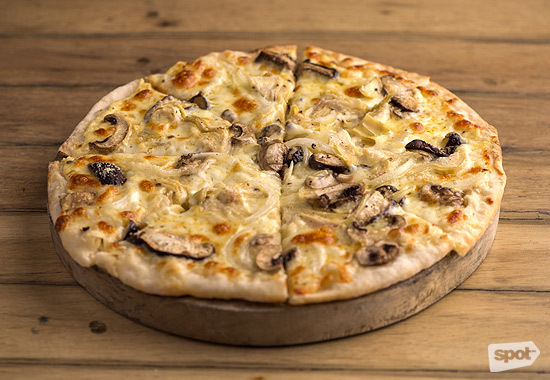 The flavor of their Truffled Mushroom Pizza (P540) is subtle, but you can add more seasoning to bring out the full flavors of the mushrooms against the blend of cream sauce, cheeses, and truffle oil. Purchase a bottle of wine, and you can get any pizza for half price. Load up on some pastas, too. The Squid Ink Alio Olio (P330) is an unconventional but welcome choice. 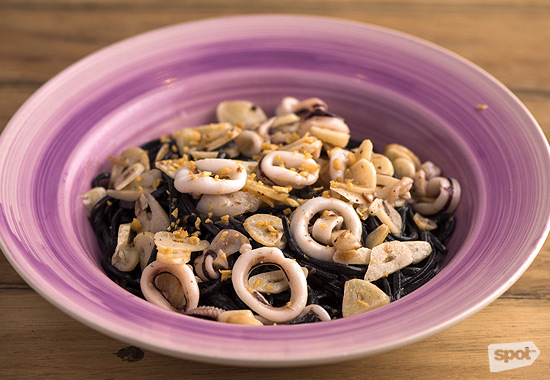 It flaunts freshly handmade squid-ink tagliatelle topped with lots of garlic, anchovies, chili, and oil. For dessert, Chef Tanya gets creative but keeps things simple. 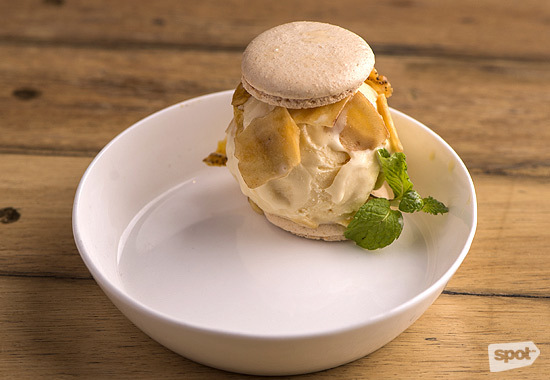 Bestsellers include the Salted Caramel Ice Cream Macaron (P100), a scoop of vanilla ice cream and salted caramel sauce sandwiched between sturdy macaron shells, and her signature Key Lime Pie Ice Cream (P100/scoop). The Stockpile may be a diner by day, but at night, it morphs to a watering hole. They have a range of alcoholic beverages on hand that you can take with some munchies. The Crispy Pig’s Ears with Sweet Sour Lime Sauce (P270) is a fitting complement to any of the craft beers they serve on tap. Count on The Stockpile to have all your trusty favorites in check. We’re keeping our fingers crossed that this time, they’ll be around a little longer, hopefully for keeps. 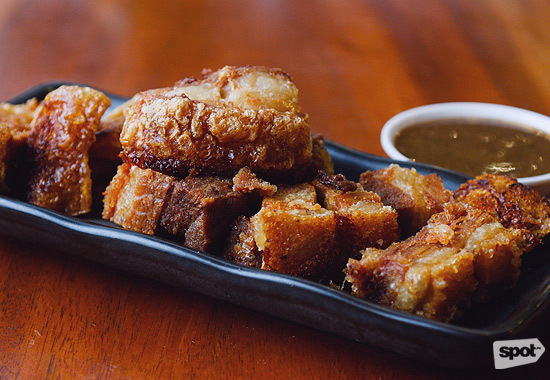 Can you enjoy Unlimited Bagnet?